"The Old New World" (Photo-based animation project) from seccovan on Vimeo. Take some old photographs, add animation in the foreground, do some other things I can't explain without exposing my ignorance, and the result is a delightful short. Amid Amidi has details at Cartoon Brew. Black macaque selfie, still copyright-free. I can use this picture because a macaque took it. Look forward to seeing it often. In August 2014, a court ruled that a human photographer who owned the camera a black macaque used to take a selfie cannot claim copyright on the picture, using the same logic that says complete strangers don't own the copyright on a the picture you took of them standing in front of the Teddy Roosevelt butter sculpture at the state fair when they handed you their phone to use. The photographer insists he will appeal and win, since he intended to take a picture. 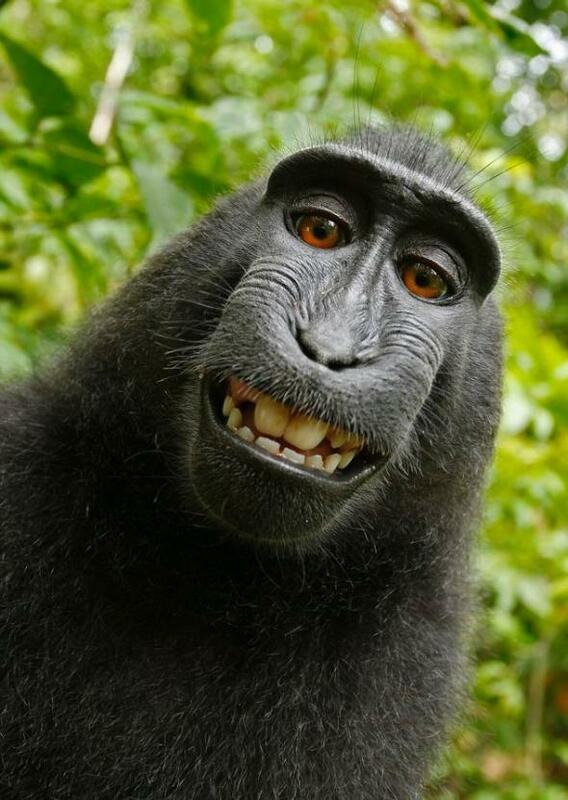 In other words: Black macaque selfie, still copyright-free. Research: "Not Quite 'Planet of the Apes'":The New York Times has this piece on bonobo research by writer James Gordon and filmmaker David Frank. "Not Quite 'Planet of the Apes'": The New York Times has this piece on bonobo research by writer James Gordon and filmmaker David Frank.